Okay, I wouldn’t (want to teach the world to sing, that is – and nor would you, despite my rendition of Kate Bush’s ‘Running Up That Hill’ on Singstar once being labelled as ‘uncanny’ in its resemblance to the original). No, this old Coke commercial song came into my head when I read this Plinky Prompt: ‘Your entire community is guaranteed to read your blog tomorrow. Write the post you’d like them all to see.‘ Do click on the link above if you want to discover what other Plinky followers wanted everyone to see. If you stay here, you’re stuck with me – and what I want everyone to see is irrelevance. What am I on about? Well luckily, Twitter (through no fault of its own) provided me with a great example to give you this very day. I follow Bill Bailey on Twitter and was quite excited to see him publicising Consensus, a science event where he will be sharing a stage with, among others, Richard Dawkins and Richard Fortey. Now while I think Mr D can go off the deep end a bit, and needs to learn a little respect for others’ beliefs (however misguided he thinks they might be), he is a knowledgeable man definitely worth listening to, and I read Richard Fortey’s Trilobite, several years ago and considered it a work of genius. I’m also a big fan of Bill Bailey, so I followed the link. It was at the ExCel! I would go! I would buy a ticket! Perhaps Arty Daughter and Techy Husband would want to go to! I …. Aaargh! Irrelevance, right there! Is there really no cause more relevant – or ironically more important for human evolution – that the profits could be given to? They’re going to give the ‘excess’ (i.e. money left over after they’ve paid Anthony Smith to make a bloody full-sized bronze statue of ARW) to ‘related’ charities. They don’t specify what these related charities are, which is odd; but could one of them be the Alfred Russel Wallace Memorial Fund, which I looked into in the hope that under their ‘projects’ tab there would be educational outreach programmes or the like? Because it turns out that this Fund is dedicated to installing and renewing plaques just about everywhere that ARW drew breath, and maintaining his grave. Nothing else; just that. What a fitting tribute to a great scientist… not. It’s the Medway Queen restoration project all over again; let’s spend £4 million (it may end up as more – just reconstructing the hull has cost £2.6 million so far) preserving a boat because it saved some lives at Dunkirk. Let’s ignore how many extra lives we might save with that £4 million pound. If I was a Dunkirk survivor, that would make me sick to the stomach; a far better tribute to the bravery shown that day is surely to fund some modern day bravery via aid workers or charities, or normal folk trying to survive life. What about spending £1 million on malaria nets? Another £1 million helping schemes like The Big Issue to rescue people from poverty and homelessness, and five them back a bit of pride? Sending another £1 million to the Philippines? Another £1 million on dialysis machines, incubators, all those drugs our country supposedly can’t afford to give people because it’s not in their area – or our country’s – budget? We know what Alfred Russel Wallace achieved and we know what the Medway Queen achieved. And they will carry on being irrelevant until nobody is dying for want of a few pounds. A warm bed. A decent meal. A vaccination. The right medicine. Incidentally, if you would rather be relevant – would like to think that you’ve saved or radically improved the lives of other human being,s rather than paid for a custom-made, hand-crafted rivet on a rusting old ship or the bronze-rendered nostril of a long-dead scientist – you might like to consider donating your £24 (the price of a Consensus ticket) to The Big Issue Foundation or the Disasters Emergency Committee. Just sayin’. Yes, I dabbled in a drabble. That is, a teensy tiny story. And it was fun. One of my fellow #100kwords100days members, Gerald Hornsby, mentioned an anthology that was looking for sci-fi and fantasy stories just 100 words long. As I had a bit of time on my hands that day and submissions were about to close, I had a go. It’s amazing how much editing you can do on a 100 word story, which is ironic (you’ll see why in a minute). But I sent off my drabble, entitled Valhalla, and hey presto! 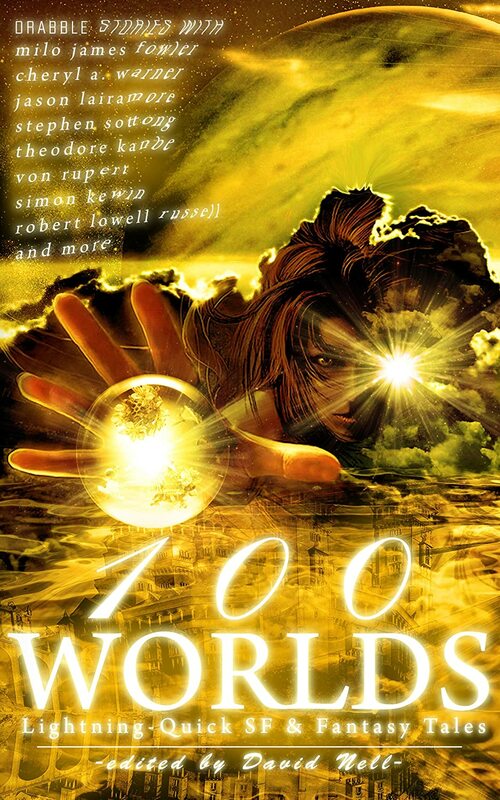 it was accepted into 100 Worlds: Lightning-Quick SF and Fantasy Tales . I got the ebook for free but didn’t get a chance to look at it – anyway I fancied the paperback, which arrived today.